The role of all citizens, including the “New Europeans”, is crucial for the construction of Europe. It is strongly necessary to place all the European citizens at the heart of the European project in order to reach a more democratic and more united Europe. Unfortunately, the growing lack of interest in European citizenship is worrying. Indeed, European citizenship is a decisive topic in the context of approaching European elections. Today, the European citizens are more and more aware and informed. As they enjoy the right to vote they have the opportunity to express their freedom, but a considerable part of them will not go voting on the 25th of May. In Mr Martinez Martinez opinion, this paradox can be explained by the lack of solidarity in today’s European project. He regretted the fact that the European citizens feel distant to the European project essentially because of the “non-united” proposals which are now dominating the European political scene. Finally, the Vice-President added that the challenge for all MEPs and others stakeholders of European politics is to make European citizens more aware about the issues at stake for the upcoming elections. Mr Grill intervened to describe the activities and the importance of the European Ombudsman. Indeed, one of a greatest right of European citizens is the one to complain of the European institutions and administration to an authority. He reminded the audience that the right to complain of European authorities is a fundamental right constitutive of European citizenship. Mr Martinez Guillen assessed five years of European legislature and explained the role of the Information office of the Parliament in making European citizens more aware of the elections of May. He also specified that peace in Europe is the result of a continuous dialogue between citizens and their representatives. 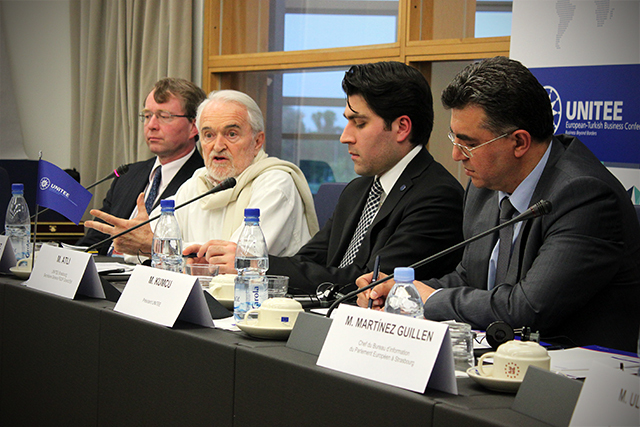 Mr Martinez Martinez described Europe as a continent historically victim of intolerance, authoritarianism and violence. Today, Europe is a political miracle but not a definitive one. Even though Europe has become a universal paradigm of peace and tolerance, it needs constant work to protect and maintain it. The Vice-President also warned European representatives to not forget their mission to be constantly along the side and listening carefully to European citizens’ claims. At the end, Mr Kumcu explained how essential it was to continue believing in Europe and to make of cultural diversity an asset for European citizenship. His last remarks were to assess that Europe had become a paradigm of peace and prosperity. Read the full French and English report. View the gallery here.